Sampdoria coach Sinisa Mihajlovic said he felt an early goal could have derailed Roma, after their 0-0 draw in Serie A.
Rudi Garcia’s Roma were coming off a 7-1 UEFA Champions League shellacking at the hands of Bayern Munich in mid-week. 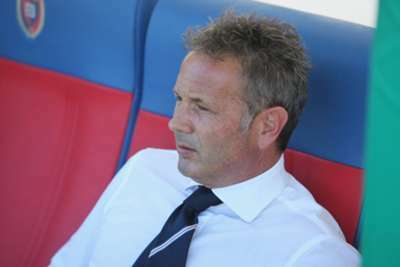 Despite failing to trouble the scorers at home in Genoa, Mihajlovic hailed his side’s improved mentality – the club is through eight games in the league without loss. “We pressed in a very attacking way in the opening 15 minutes, as we thought that if we scored early they would crumble,” Mihajlovic told Sky Sport Italia. “They had chances with Gervinho in the first half and [Alessandro] Florenzi in the second, while we went close with [Stefano] Okaka and several set plays. Argentine goalkeeper Sergio Romero took the spot of injured custodian Emiliano Viviano, with Mihajlovic claiming it is not difficult to keep the former satisfied on the bench. “It wasn’t difficult, as you must always be fair and honest with players,” said the Serb. “He always acted like a great professional, we all know Romero’s quality and he had a great performance today. Mihajlovic also offered his opinion on the state of the Stadio Communale Luigi Ferraris, claiming it was tough to play possession football. “The pitch was not in good condition and the bounce was awkward, so that makes it difficult for teams accustomed to playing ball to feet,” the Serbian said. “It can cause a split second delay to adjust positions and that means passes, shots and even offsides are affected.